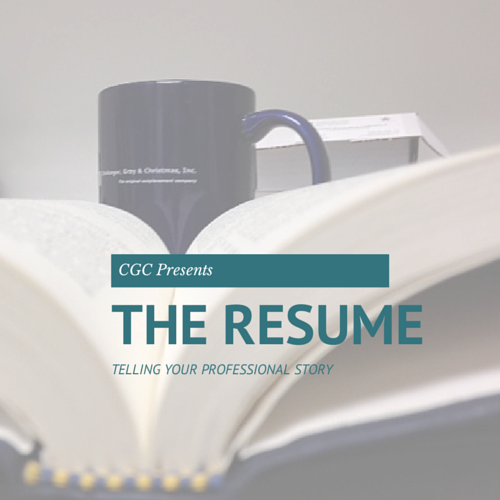 The Resume: Telling Your Professional Story | Challenger, Gray & Christmas, Inc. Even if you're not a salesperson, when looking for a job, your only job is to sell yourself. You're convincing employers that they need you, that they can't keep doing business without you, and the best way to do this is to craft a compelling professional story. The resume is the the first tool available to you to tell this professional story. Think of it as your brochure, the job of which is to sell you, the product to your target audience, the employer. The resume presents your best professional self, and acts as a sort of table of contents for your professional story. Your familiarity with it should be such that any questions posed by an interviewer regarding what’s on your resume will bring an immediate and thorough response. After all, you should be able to “do” what your resume says you do. should be able to generate a success-oriented story out of each item listed. costs saved. Study these key words, and use them during networking opportunities and interviews. If you keep these tips in mind at an interview or networking event, your knowledge of not only what is listed on your resume, but also of the accomplishments you achieved at your previous companies will make an impression. Your professional story is what will make a contact think of you when presented with a job opening. If the resume tells that story and you're able to flesh out the details, you will perform well in interviews and meetings.